/omen·tal/ (o-men´t'l) pertaining to the omentum. pertaining to or emanating from the omentum. 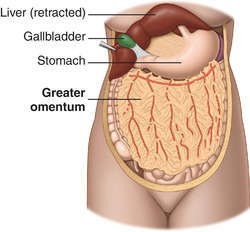 passage of a loop of intestine through a tear in the omentum. The surgical management of peptic ulcer perforation was mainly by simple closure of perforation with omental patch. For patients operated via the abdominal route, 18% needed an omental flap; no tissue interposition was used for the remainder. The most common pattern of peritoneal involvement was mixed in 43 patients (34%), omental caking in 36 patients (28%), nodular deposits in 32 patients (25%), smudge pattern in 13 patients (10%) and cystic pattern in three patients (3 %). 065) in the survival distribution among the patients who underwent curative resection and those who had simple closure with omental patch. An omental tag of tape as a tubular securing mechanism, in addition to the skin suture, basically helping prevent volvulus, reduce complaints of local pain caused by traction and accidental dislodgement of the drain, and was a routine procedure in most of the cases. Omental interposition is not essential for good healing. All patients diagnosed clinically with perforated peptic ulcers, admitted to VS Hospital during the period of January 2013June 2014, were prospectively nonrandomized to undergo either conventional open or laparoscopic suture omental patch repair (consent and cafeteria approach). On examination, omental thickening was noticed and there was mild ascites. We present two patients with TDR with fractured rib sign on initial trauma multidetector computed tomography (MDCT) and subsequent herniation of omental fat, the funky fat sign, within two weeks of the injury. La disposicion de estas hojas de peritoneo forma un espacio que en el lado izquierdo no esta ocupado por ninguna estructura, lo que hace suponer la existencia de una cavidad omental similar a la de los mamiferos domesticos, mientras que el espacio del lado derecho esta ocupado por la vesicula biliar, conductos hepaticos derecho e izquierdo, primera porcion del duodeno, y vasos arteriales y venosos.